OUAFC's FA Cup-winning team of 1874. Founded in 1872, and playing its first game against Radley College on 10th February of that year, Oxford University Association Football Club is one of the University’s oldest and most prestigious clubs. Oxford played in the FA Cup from 1872-1880, reaching the final five times including in its first season and winning the trophy in 1874 with a 2-0 victory over the Royal Engineers at Kennington Oval. 29 players have won full International caps for England, six have played at this level for Wales, and one for Ireland in addition to the 25 who have won Amateur International caps for England and four for Wales, while others have been members of Great Britain’s Olympic Games teams. Many former OUAFC players have played for Football League Clubs, the most famous being K. R. G. Hunt, who scored the first goal for Wolverhampton Wanderers in the FA Cup Final in 1911, and C. B. Fry, the great English cricketer and long jump world record-holder. 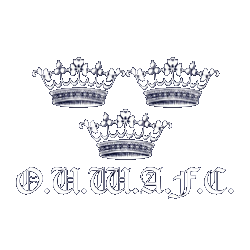 Along with CUAFC, OUAFC provided the backbone of the Corinthian and Pegasus Clubs. Home matches were played originally in the University Parks, where the Centaurs (the University second team) still play their matches. The first match at Iffley Road was played in the 1899-1900 season, on what is now the rugby pitch. On 1st December 1921 the first match was played on the current ground, inside the athletics track at Iffley Road. Spurs beat OUAFC with a penalty after OUAFC player Barber had earlier kicked the ball from the penalty spot back into play rather than attempting to score a goal, under instruction from his captain Butcher who had thought the referee’s decision was harsh. Iffley Road became famous on 6th May 1954 when Roger Bannister ran the first sub-four-minute mile on the athletics track. Every year OUAFC competes against Cambridge University in the Varsity match, one of the oldest regular fixtures in world football. The match has been played annually since 1873 (with a break for the Second World War). Those who compete in the Varsity match receive the much sought-after full blue in addition to playing a part in the history of one of football’s longest-running rivalries. In 2017, Oxford won the 133rd Varsity Match 3-2. The record is remarkably close: after 133 Varsity matches over 140 years, Oxford have won 52 matches while Cambridge have now won 49 (with 32 draws); Oxford have scored 211 goals to Cambridge’s 207. OUAFC competes against other Universities in the BUCS League. The Blues won Division 2A of the BUCS league in the 2012/13 season and now compete in the Division Midlands 1A. Additionally, the Centaurs (2nd team) compete in Midlands 4A and the Colts (3rd team) in Midlands 5A after winning Midlands 6A in their debut season in 2014/15. 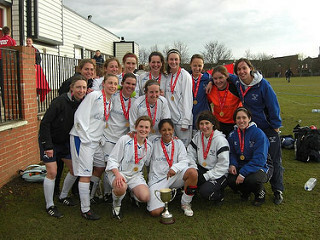 Oxford University Women’s Association Football Club, OUWAFC, was founded in the 1980s and merged with OUAFC in 1998. The first Women’s Varsity Match was played in 1986, in which Oxford clinched the victory, beating the Light Blue side 4-3. Out of the 29 Blues Varsity Matches to date, only 2 have ended in draws, with the Dark Blues winning just 8 of the games. However, considering just the last 10 years, the Dark Blue side has been successful on 4 accounts, making for a relatively close record in recent years. 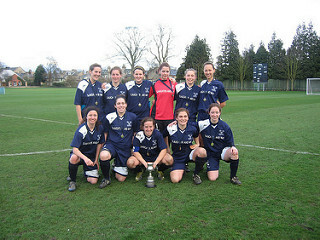 Those women who compete in the Varsity match receive an Oxford Half-Blue in recognition of their footballing success, with the Full Blue status being achieved if Oxford win the match, or the squad have a “successful” season in BUCS with regards to the Blues status conditions. In 2015, Oxford won the 30th Varsity match 7-1. OUWAFC competes in the BUCS League against other universities in the UK. The Blues won BUCS Midlands Division 2A in the 2013/2014 season, gaining them promotion into Midlands 1A, along with their Light Blue rivals.